Ali Shirazi, a top Iranian cleric, told Asr-e Iran News Agency there is "no doubt" Baghdadi is deceased. Irib, Iranian media outlet, has posted photos of Baghdadi's dead body. The man's face resembles Baghdadi extremely closely. Sputnik has learned that the photo is from 2015 and is actually a fake. “It is highly likely that Daesh leader al-Baghdadi was eliminated as a result of a Russian Aerospace Forces strike on the terrorists' command post in the southern suburb of the city of Raqqa in late May this year," Russian Deputy Foreign Minister Oleg Syromolotov told Sputnik last week. According to Islamabad-based analyst Nauman Sadiq, "It is not in Washington’s interests right now to confirm the deaths of the Islamic State’s top leaders even if it has received credible reports of their deaths because the US troops and affiliated local militias have mounted offensives against the Islamic State’s strongholds of Mosul and Raqqa which have caused colossal loss of human lives." Al-Baghdadi gained worldwide notoriety for declaring a new caliphate in the Middle East in 2014. 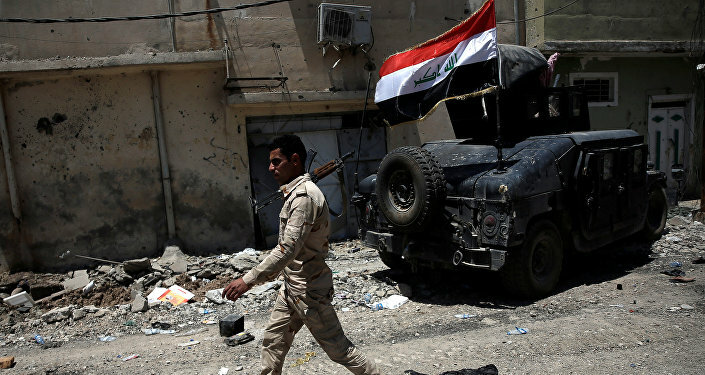 The al-Nuri mosque in Mosul, Iraq, where he proclaimed the caliphate, was liberated by Iraqi security forces on June 29, according to the Independent. "It’s now undeniable that reduced external support for the 'rebels' was a critical turning point for really crushing ISIS," said Max Abrahms, a political science professor at Northeastern University and a member of the Council on Foreign Relations.